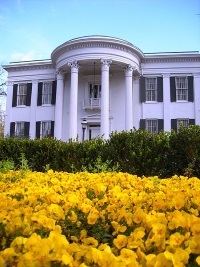 The Mississippi Governor's Mansion in downtown Jackson is the second oldest continuously occupied governor's residence in the United States. It was first occupied in 1842 by Governor Tilghman Tucker and his family, having just been built in the Greek revival style, the most popular style of the period. Today architectural historians consider the mansion one of the best surviving examples of this style in the country, and in 1975 the building was designated a National Historic Landmark. The historic section of the mansion, furnished in period Empire style, is open to the public. Opening times: Guided tours run every half-hour between 9:30am and 11am, Tuesday to Friday. The mansion may be closed on occasion for official state functions, and is closed the last two weeks of December.